ECTOPIC just means ‘in an abnormal place’—in the case of pregnancy, it can be in other places. Most are in the tubes, but a pregnancy can also be in the cervix, in the ovary, in the abdomen(attached to bowel or other organ). What puts you at risk for ectopic? previous appendicitis or other pelvic surgery–even C. Section! YOU DON’T HAVE TO HAVE A “RISK FACTOR” TO HAVE AN ECTOPIC! ECTOPIC PREGNANCIES CAN KILL YOU–do not delay seeking help if you have these risk factors, and go to the ER if you have pain while newly pregnant! YOU CANNOT SAVE THE BABY! The baby (embryo/fetus)cannot be moved into the uterus–the WHOLE thing with ectopic is to SAVE THE MOTHER!!! click here to see a good video explaining ectopic! So, if you come in, and you are at risk for ectopic–and basically, the safest way to think is that everybody has an ectopic, until PROVEN otherwise, we need to do further tests. Typically, an examination is done–this will determine if you are STABLE–is your blood pressure OK, are there signs that your belly has blood in it (PERITONITIS), how much PAIN are you having, have you passed out? Sometimes, all we need is a positive urine pregnancy test, and the exam–if a woman is in a great deal of pain, and has peritonitis, or is dropping her blood pressure–we don’t need–or often have time to do other tests. We always try to get an ultrasound if stable! Now–if STABLE, we will typically do an ultrasound to see if the pregnancy is in the uterus–if it IS, then we can all relax–the odds of having a pregnancy in the uterus AND in the tube is like 1 in thousands.I have seen it once–and both embryos were lost. If we DON’T see a pregnancy in the uterus, and there is no blood seen in the abdomen on ultrasound, and no signs of a tubal swelling to point to an ectopic, then we do blood pregnancy test. A blood test for pregnancy is more than a urine test–it gives us a number–an amount of pregnancy hormone! 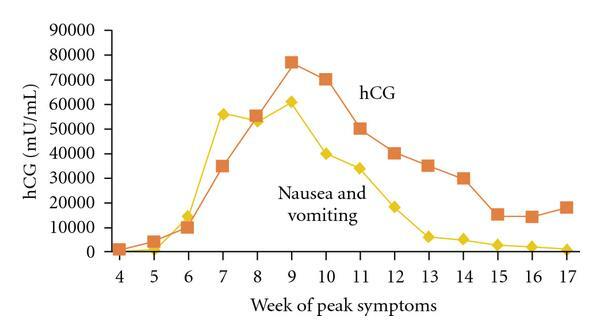 In the first few weeks of pregnancy, the HCG (pregnancy hormone), goes up (as it goes up you may get that “ALL DAY” sickness–who the heck came up with MORNING sickness—I think some man who only saw his wife puke before he went to work!). Sorry—I digress! In a normal pregnancy, s simple rule of thumb is that the level of hormone will double every 48 hours. Now if your first HCG was something low–like 76 for instance–or 81 or 103–I would not be too happy about that! But–if it is say 800–then I’d be a bit more optimistic–repeat in 2 days–it had better be 1600, then 2 days after that–3200 then 2 days after that 6400…at least for the first 10 weeks of pregnancy–then the levels NORMALLY start to fall—so the puking often eases up! Or, you may be the poor bugger who pukes the whole pregnancy—sigh! The actual number of HCG can be VERY different in each woman and really isn’t the best test to see how many weeks you are–you could be say 6,000 at 6 weeks or 38,000—–the BEST way to see how far along you are is to keep track of the START of your periods, and getting an early ultrasound. 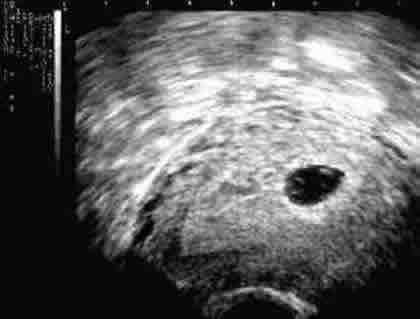 5 week pregnancy–see there is a little circle inside the bigger circle? This is a picture of the sac with a tiny little nubbin in there–size of a kidney bean! About FIVE weeks! Now if your level goes up to point that we SHOULD DEFINITELY see something in uterus–no ifs, ands, or buts–and we DON’T see anything in the uterus, then we are really concerned about ectopic!! Nowadays, we often treat early ectopic pregnancy MEDICALLY with a drug called METHOTREXATE. People take methotrexate for arthritis, and it is also used for chemotherapy. We use it to treat ectopic pregnancy by killing the rapidly dividing cells. You can only use Methotrexate if you are NOT RUPTURED, and if there is no fetus seen, and there is no mass (swelling of tube), seen over about 3 cm. In certain cases of ectopic, medical management may the tube, and save a surgery! It is very important that you have quick access to a hospital, and that you follow the HCG blood test right down to NEGATIVE—there is a risk of rupture even as the HCG levels are falling! If the levels of HCG don’t drop, you can repeat the Methotrexate–but you may have to go for surgery if not eligible for a repeat dose. If you are stable, then surgery is usually done laparoscopically. The portion of tube where the ectopic is, is either removed (especially if you want no more children), and one can also “tie ” the other tube, or it can be tried to save the tube. Remember that the tube is often damaged in the first place–which is why you GET an ectopic. Saving it can put you at risk for ANOTHER ectopic. Saving the tube also means you have to be followed carefully with blood work, to make sure the HCG (pregnancy hormone) levels are continuing to drop all the way to NEGATIVE. We cannot scrape the tube like a uterus with a D&C, so there is always the chance that some pregnancy tissue can be left in there. We cannot see with our eyeballs–it would require a microscope. This tissue may continue to grow, and you end up with the same ectopic pregnancy still a problem, and a RISK! We want to make sure your pregnancy test goes back to NEGATIVE before you try to get pregnant again–or we can discuss birth control. click here to see a video where the tube hasn’t ruptured and the tube is being removed by keyhole surgery. click HERE to see a ruptured ectopic. WARNING—BLOODY!!!! You can see on the video why saving the tube when it is such a mess can lead to problems–so if it is saved, and you get pregnant again, we have to check to make sure it is not another ectopic pregnancy. Sometimes, a woman is so badly in shock, we don’t have time to do laparoscopic surgery–we cut a bikini -cut–the same as a C. Section, and clamp the tube and remove it–a woman has to be STABLE to have laparoscopic surgery. If she is dropping her pressure, or getting blood transfuion, you have to move FAST! CLICK HERE to see the bikini cut–WARNING we reason we do this is because the bleeding is bad inside the belly–so brace yourself for BLOOD!!!! This surgeon does a fast, and lovely job of getting that ruptured tube! Ignore stupid comments—nothing wrong with surgery—this is REAL LIFE!!! Sometimes you don’t have time for laparoscopic surgery! You can see when he gets into the belly, he is greeted by nothing but blood –she is bleeding into her belly and could die. Now, if you have had an ectopic–you are at increased risk for another–BUT MANY women get pregnant with only one tube!! Don’t give up if you want a child–talk to your doctor about the condition of your tubes. Next Next post: The Importance of Being Thorough!